Living with Clyde Tombaugh was like having the celestial universe in the next room, but I found it a very good neighbor. Mars and the Moon were his favorite telescopic studies. At the age of 12 Clyde found astronomy through his love of geography. What would be the geography of other planets? When Clyde Tombaugh discovered Pluto in February 1930, I was in high school at Westport High in Kansas City, Missouri. I graduated in 1931, and about a year later my widowed mother moved us to Lawrence, Kansas. There, her three children were to work their way through their father's (J.O. Edson's) alma mater, the University of Kansas. I met Clyde in the spring of 1933. He and my older brother, James B. Edson, were astronomy majors and good friends at KU. James brought Clyde to rent a room at our house for the next school year. Clyde returned to Lowell Observatory for the summer, and we exchanged letters during that time. 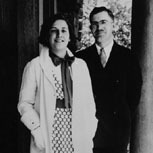 Patsy and Clyde Tombaugh, circa 1935. Image credit: New Mexico State University archives. In the fall of 1933, Clyde (who had a scholarship) returned to Lawrence to be a student roomer at our house. During that year the Syzygy Club formed. The club's six or seven members met at our house. We talked of rockets and space travel, space platforms and astronauts. We never spoke to the outsiders about this. They thought we were really and completely crazy. I had painted tennis balls to look like Mars and Jupiter. Clyde thought any girl who was that into astronomy was pretty cool. We were married June 7, 1934, with a small event at my mother's home. I had finished my freshman year and Clyde his sophomore year. I was 21, and he was 28. We spent summers in Flagstaff, Arizona, at Lowell Observatory as we worked our way through college. Clyde was still on the project searching for a 10th planet. We lived in a small, brown, shingled cottage on the observatory grounds among the pine trees 300 feet above the town. We cooked and heated with wood fires and had no refrigerator, telephone, or washing machine. It was a new experience for this city girl, but I loved this beautiful and interesting place, meeting very special people, and getting acquainted with the ways of various Native American tribes there. Flagstaff's population then was about 4,000 people. Clyde finished his first degree in 1936. We then went to live and work at the observatory full-time. After saving up for two years we returned to KU. Clyde received his master's degree in astronomy, and I finished my degree in philosophy in 1939. We returned to Flagstaff and to parenthood: daughter, Annette, was born in 1940 and son, Alden, in 1945. In 1942, we bought a house in Flagstaff and moved off of Mars Hill into town. During World War II Clyde had been called to teach navigation to new Navy pilots at the Northern Arizona College. He was also Commander of Civil Defense for Coconino County, Arizona. At the end of WW II many changes occurred rapidly. In 1945, Clyde was a visiting professor at UCLA. In 1946, he left Lowell Observatory. We moved to Las Cruces, New Mexico, where he was Chief of the Optical Measurements section at White Sands Proving Grounds (WSPG). There the American Space Age was in its birth pangs. We watched the delivery with great joy and excitement! The children grew, and I worked on the New Mexico State University campus at the Physical Science Laboratory reading rocket film and plotting flight trajectories. After nine years with rockets, Clyde wanted to get back into astronomy. He proposed and received a grant to search for small natural satellites of the Earth. He left WSPG (now WSMR, for White Sands Missile Range), moving this project to the Physical Science Laboratory on the NMSU. campus. Clyde later established a Planetary Research Center there, which was supported by grant money. These efforts led to the creation of a Department of Astronomy for a doctoral degree program at NMSU, and also a leading observatory called Apache Point. Apache Point is financed and used by a consortium of universities and the Sloan Digital Project exploring the outer edge of the universe. Of course, I always had to share Clyde not only with Mars, Jupiter, the Moon, and stars, but also with the public. As the Space Age grew so did Clyde's fan mail. From all over this world came letters from all age groups asking for information or autographs. He once said that he had received at least 30,000 letters. He tried to answer each one. Clyde had minored in geology to apply that knowledge to the study of Mars and the Moon. He later taught geology at NMSU. He collected rocks everywhere. He carried an Earth globe in his head and loved maps and glass - colored or clear. He had a weather station of his own and made a graph of rainfall in Las Cruces over the years showing drought periods. He was a master at creating telescope mirrors and always had one in process. Clyde loved animals. He said he spent more time with horses on the farm than with his family. He knew the game of football. He was once asked to call a play at an NMSU game - that call resulted in a field run and a touchdown. They gave him an "honorary coach" plaque. The press, media, civic clubs, and schools gained from Clyde's willingness to share his passion for the study of the heavens. He was an excellent teacher. A beautiful Las Cruces elementary school carries his name. Being a Depression child on a farm, he kept everything and delighted in making trash into something. He had a cluttered desk in his office - I called it organized chaos. Yet he knew where each thing was hidden among the pile. Las Cruces loved Clyde. Three of our governors named a state day to honor him. School children over the world love Pluto. It is small like they are. Clyde would have been very excited and interested in the new 10th planet. His life was not wrapped around Pluto. His life was wrapped around the study of the whole universe. Of course, Pluto made him a star to others, and he tried to satisfy the demand. He said his most reverent moments were at the eyepiece of a telescope. Clyde W. Tombaugh was a caring person. He wanted to give young people credit for their role in any project. Thus, giving them a good start in the field. Clyde was granted his wish to reach age 90, living to within three weeks of being 91. He was one happy man the day of his 90th birthday party - many family members, friends from the days of White Sands, NMSU, and the Unitarian Church that he helped to establish in Las Cruces were there to help him celebrate. He died on January 17, 1997. Clyde and I were a great team.